As families look for ways to cut costs, many are turning to Multi-Generational housing. This allows an elderly parent or adult child to move back home, while still having the privacy and independence of their own place. 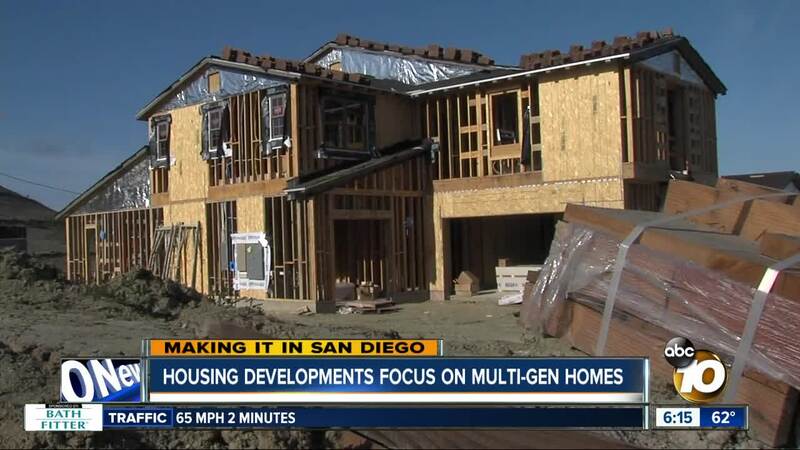 SAN DIEGO, Calif. (KGTV) - Developers in San Diego are offering a new concept for families looking for homes: Multi-Generational Housing. The homes include a separate suite within a single structure. The suite has a bedroom, living area, bathroom and a small kitchen. Developers say the idea designed with let elderly relatives, adult children who move back home or relatives with special needs in mind. "You’re still with the family, but you have that privacy to step away and still be independent," says Bill Ostrem, the San Diego Division President for Lennar Homes. "At the same time, if you want to engage with the family, the family wants to engage with you it’s right there." Lennar says they started developing these kinds of homes in 2011 in Arizona. They saw a need as more extended families began living together. The suites help with that. Currently, Lennar is building their "NextGen" homes in the Sterling Heights community near 4-S Ranch . Ostrem says it's become their most popular model. About 1/3 of all the homes they've sold in Sterling Heights have the extra suite. They have other developments with NextGen homes in 13 states. "I think it just makes sense," says Austin Dias, a Co-Partner with The Phair Company. They're about to start construction on La Mesa Summit Estates just north of the 94 freeway near Lemon Grove. All 30 homes in that development will have a "Multi-Generational" suite. Dias says they held a couple of community meetings during the planning stages. The overwhelming response they got was from families looking for these kinds of homes. "We see this a lot in other countries," Dias says. "Now people in America are starting to embrace it." The homes are pricey. Models in Lennar's Sterling Heights development run between $1.7 and $2 million. But Ostrem says it can help families save money by not having multiple mortgages or rent payments across the city. He adds that City laws and HOA rules will help keep the extra suites from turning into rental properties or vacation rental units. Model homes are already open at La Mesa Summit Estates. The Phair Company hopes to begin construction this summer and have homes ready by 2020.